Henry Ho'olulu Pitman, the son of a Hawaiian high chiefess, was born in Hilo, served as a young man in the Union Army during the American Civil War, and died from the effects of being held in the South's Libby Prison. James Bush, also part Hawaiian, was in the Union Navy in the war between the states, and he received a veteran's pension when he was older. The history of Isle service on both sides of the war isn't widely known, said Justin Vance, a Civil War and military history professor at Hawai'i Pacific University. 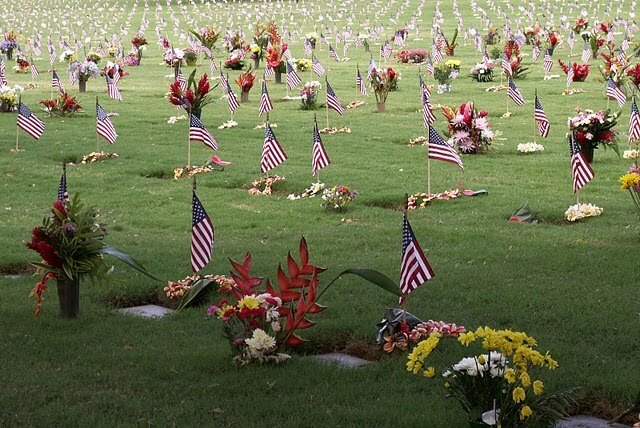 As the nation today remembers its war dead, a few in Hawai'i are trying to recognize the service of Isle residents from the conflict that preceded the establishment of what is now known as "Memorial Day." Go to this link to read the story in its entirety. The Hawai'i chapter of the Civil War Roundtable, a national organization, is spearheading a drive to raise the remaining 30 percent of the $3,500 cost for the bronze plaque (pictured above) and stone base commemorating the service of the Hawai'i Sons of the Civil War. Donations can be made to the O'ahu Cemetery Association at 2162 Nu'uanu Ave., Honolulu, HI 96817. The History Education Council of Hawaii salutes the men and women of America who sacrificed personal liberties and freedoms so that others across our nation could enjoy theirs. Memorial Day is our Day of Remembrance dedicated to those who are no longer with us. 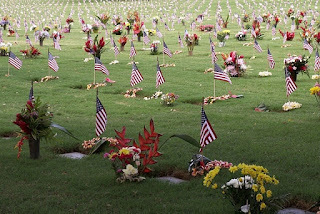 Across Hawaii the graves of our soldiers are decorated with flags, Hawaiian leis and other mementos. The picture above was taken by Jeffrey Bingham Mead at the National Cemetery of the Pacific in Honolulu on Memorial Day 2008. We call your attention to this link on the history of Memorial Day, courtesy of the Department of Veterans Affairs. The Public Broadcasting System (PBS) features this web link to the National Memorial Day Concert and other information about the holiday. We direct our readers to the Online Publications link on the National Council for History Education's (NCHE) web site. At this time editions from February 2010 to May 2010 are available for download in pdf format at this link. MIT World is a free and open site that provides on demand video of significant public events at the Massachusetts Institute of Technology. MIT World's video index contains more than 700 videos. These are also available to those with access to iTunes on their computers. You can go to the web site link and browse at your leisure. 1.) "There was a time when it took enormous effort to make MIT students comfortable with subjects that had 'not just one right answer'. And so it has become easier to achieve what I think is the real purpose of humanities education at MIT and everywhere, not to train, but to educate." Herein lies the theme of Pauline Maier on teaching history at MIT. 2.) Patriotism and Reconstruction: Washington, D.C., after Conquest and Arson during the War of 1812. The 24-hour occupation of the nation's capital by British forces during the War of 1812 was arguably the lowest point in American history. 3.) Spectacular Reconstructions. Ways of Seeing and the Politics of Recovery in American Urban Disasters. Kevin Rozario uses the two most devastating urban catastrophes in American history, the Chicago fire of 1871 and the San Francisco earthquake of 1906, to explore how extraordinary recovery from sudden ruination can be both compelling and inspiring. 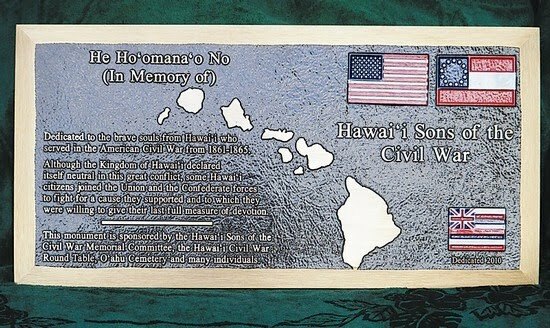 The Hawaii Sons of the Civil War Memorial Committee is seeking funds to help pay for a memorial plaque honoring individuals from the Islands who served in the Civil War. The memorial will consist of a bronze plaque mounted on an a granite base. It will feature Union and Confederate flags and be placed along the Memorial Walk at the National Memorial Cemetery of the Pacific. A news release from the Hawaii Civil War Round Table says exact numbers of men with Hawaii ties who served in the war are hard to come by since Native Hawaiians were often given made-up names when they signed on with whaling ships that went to join Union and Confederate navies. • James Bush, a Native Hawaiian who served in the Union navy. • Twelve Hawaiian sailors serving aboard the CSS Shenandoah, which actually fought in the Pacific. • Samuel Chapman Armstrong, the son of Hawaii missionaries, who became a brigadier general in the Union army and would go on to found what is now Hampton University. The Round Table says a dedication ceremony will be held later this year. Donation checks can be made payable to the Oahu Cemetery Association at 2162 Nuuanu Avenue, Honolulu 96817. Please note on the check that it is for the Civil War plaque.